As a technical writer for Spanco, Inc., I’ve spent nearly five years writing about material handling and overhead lift solutions. I am passionate about the industry, and I particularly enjoy trying out new systems and writing about what makes them unique. 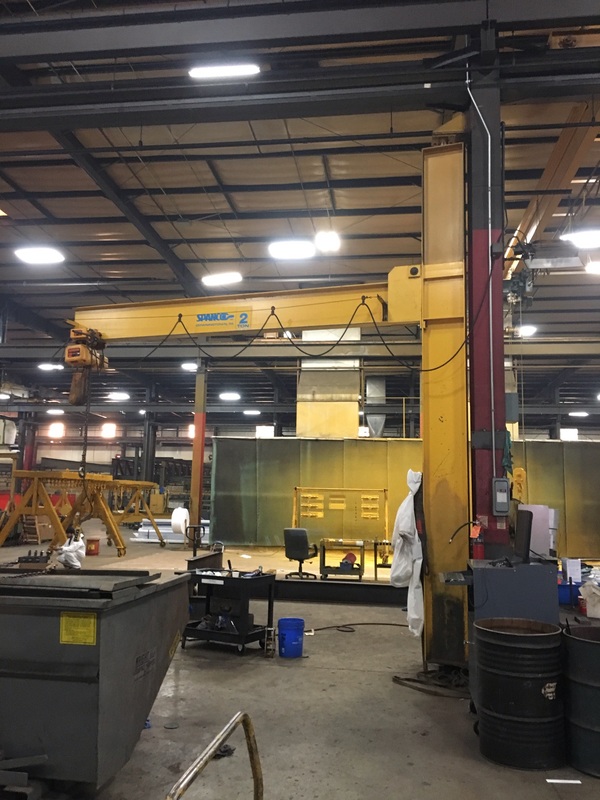 Recently, I had the opportunity to test a custom-designed workstation bridge crane that was newly installed in our production facility. Before installing the workstation bridge crane, workers used a series of wall-mounted jib cranes over individual work areas. Overtime, our production manager began inquiring about a more fluid system to provide better shipping times and improve worker safety. That’s when our engineers and production team began designing the perfect solution to replace the jib cranes and create one ongoing system for packaging and shipping. The jib cranes were not ideal for the changing needs of the facility, while the custom-designed bridge crane would provide a unique and effective solution for a very specific application. 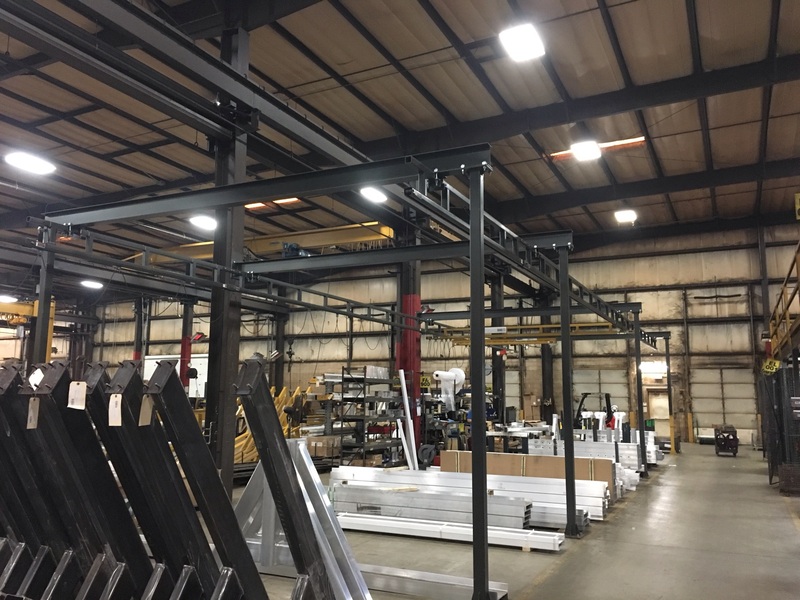 The new system consists of two interconnected custom-designed freestanding workstation bridge cranes, which have greatly improved worker safety, along with production and shipping times. The complete system is used for the assembly, packaging, and shipping of aluminum gantry crane frames. The bridge cranes were designed with a total runway length of 66 inches for both cross sections and a bridge span of 16 feet for each runway cross section. The first cross section is customized with a telescoping bridge that extends four feet into the walkway to access hardware for assembling and packaging products. This provides a safer work environment and frees up existing overhead cranes for loads weighing more than 4000 pounds. Our workstation bridge cranes are designed using a trussed, enclosed track, with a “V” shaped profile that prevents dirt accumulation and maintains end truck and trolley wheel alignment. This—along with large diameter polyamide wheels—provides smooth movement and a long, steady operating life. Workstation bridge cranes are used for ongoing rectangular coverage, allowing a single worker to ergonomically move loads from one work area to another. The newly customized system was installed in our Morgantown, Pennsylvania factory to help workers move repetitive loads weighing anywhere from 50 to 4000 pounds without compromising safety or efficiency. 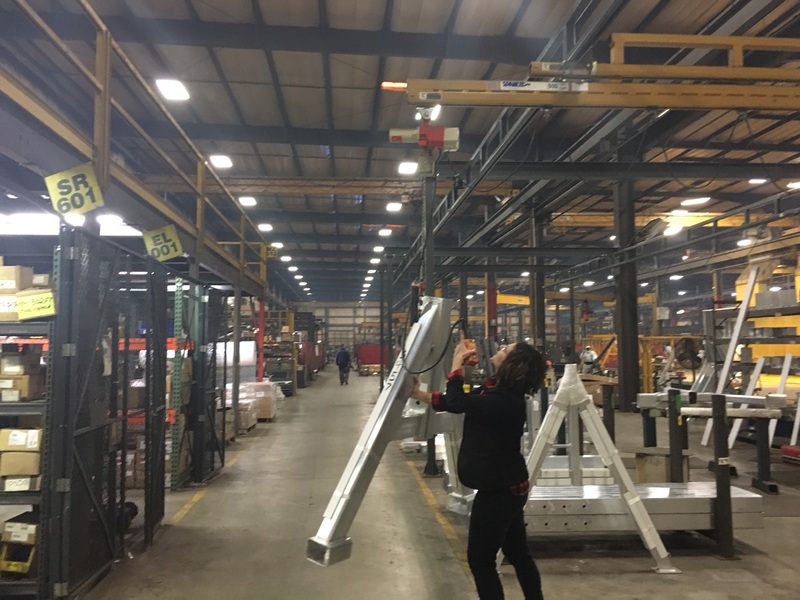 In this case, workers use the system to transfer aluminum gantry frames from packaging to shipping—quickly and easily. The hoist is motorized and fitted with a pendant station, which allows workers to move it up and down with the push of a button. The bridge itself glides effortlessly from one end of the system to the other. This completely eliminates the need for manual lifting and empowers a single worker to move aluminum gantry frames from workstation to workstation. 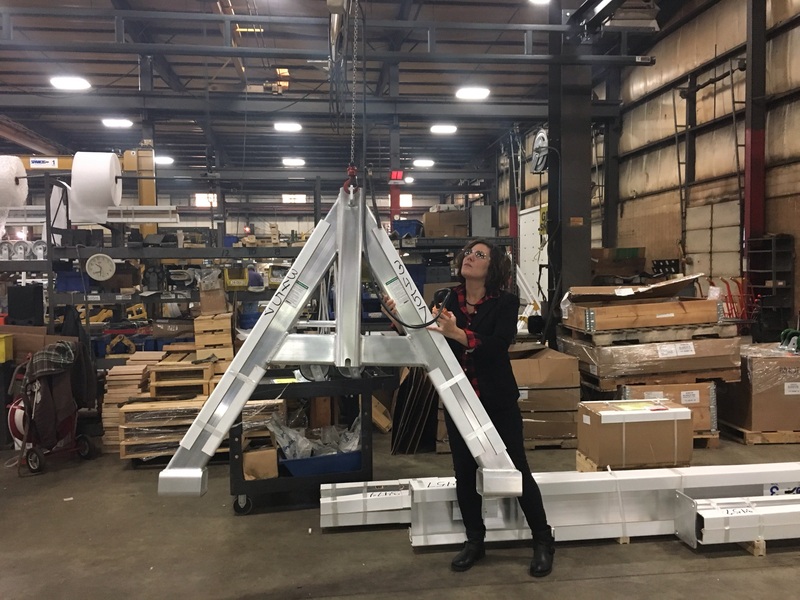 For this particular application, the aluminum gantry frames weigh anywhere from (approximately) 50 pounds for a ½-ton capacity system to 200 pounds for a 3-ton capacity system. Although gantry frames are not extremely heavy (relatively speaking), the workstation bridge crane ensures that workers can move loads from packaging to shipping without undue stress or unnecessary manual lifting. One of the most common sources of injury in manufacturing and production is due to the manual lift and transfer of smaller, repetitive loads. Workers often suffer from stress to their back, shoulders, neck, knees, and joints, which can cause serious injury over time. Ensuring that workers aren’t lifting more than 50 pounds, especially on a regular basis for several hours a day, will not only cut down on workplace injuries; it will also improve efficiency and provide a process that is much more ergonomic than manual lifting. After the system was installed, tested, and fully operating, I was given the opportunity to try it out myself. Testing these systems as they are installed affords me the unique ability to analyze the end user’s experience. The first thing I noticed was that using one custom system provides workers a lot more consistency throughout their day and completely eliminates the need for manual lifting. Rather than moving each load from one jib crane to another, the new system runs the entire course of the shipping department, creating a simple and ergonomic solution for everyone involved. The system is so easy to use, in fact, that I was able to single-handedly move the bridge under load to transport a 250-pound gantry frame from one end of the work area to another. The bridge glides effortlessly, requiring very little momentum to roll the wheels inside the track. The polyamide wheels roll along the runway without sticking, skipping, or kicking up. What’s more, the bridge came to a complete rest once I stopped pulling the load, meaning it doesn’t drift along the runway involuntarily. To learn more about this particular system and its overall design, click the button below. Feel free to post below with any questions, comments, or concerns.